The introductory menu of AdventureDisk #1. AdventureDisk was a monthly, diskette-based newsletter devoted to adventure and role-playing games for the Apple II computer, and also acted as a distributor of Eamon adventures in the mid-1980s. Each issue of the newsletter diskette included a free Eamon adventure and was accompanied by a hard copy "AdventureBook" with maps and tips for solving games. It was created and operated by Jeff Bianco. In correspondence with Huw Williams in January 2014, Bianco recalled that he first began collecting adventures in 1981 or 1982 at the age of 13 or 14, and ultimately gathered over 120 adventures which he would copy on his Apple IIe and sell by mail order along with an 8.5x11-inch sheet (later an 8.5x14-inch sheet) listing them all. Bianco charged a couple of dollars apiece, but also sold larger bundles with better values. Bianco's AdventureDisk publication, which he began in mid-1984 and ran from his home in Mercer Island, Washington, grew from this project and ran for about 10-15 issues, each of which would include a free Eamon adventure along with other content like maps or tips for solving games. A mid-1985 review by QuestBusters noted that subscriptions were $6/month or $69.95/year. In December 1985, it reported that AdventureDisk had compiled many of the best public domain text adventures for sale on three "AdventureGame" diskettes; the first volume contained Donald Brown's "Star Wars Adventure", Ragnar Fyri's Ula Tor, and several others. Bianco was assisted by a talented programmer, also in his early teens, who designed the disks' menu interface and helped create some of the content; Bianco never met him in person and in later years could not recall his name. 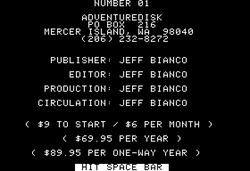 Jeff Bianco estimates that he published maybe 10 to 15 issues of AdventureDisk. The first issue is available in its entirety at archive.org; incomplete summaries from scattered sources describe the subsequent four. Number 01 July 1984 The first issue contains two complete games: Eamon adventure #65 The School of Death, and Atom 20, a stand-alone text adventure written by Ray Brander with modifications by Fes Cannady (July 1979). Other contents include a walkthrough of Infocom's Starcross; an announcement of an Eamon map contest; a list of 72 Eamon adventures and utilities; a list of adventure solutions files; a request for reviews; and various newsletter instructions. Number 02 c. September 1984 The second issue features Eamon adventure #66 The Dungeons of Xenon and an update on the map contest. Other contents unknown. Number 03 c. November 1984 Contents unknown. Number 04 c. January 1985 The fourth issue features solutions to the first three installments of the Wizardry game series, plus reviews of two games: Ali Baba and the Forty Thieves by Quality Software, and Questron by Strategic Simulations. Number 05 c. March 1985 The fifth issue contains Eamon adventure #71 Operation Crab Key. Other contents: Eamon Master Disk bug fixes; solutions to Zork III, the first half of Hitchhiker's Guide, and a few others; and a list of 81 Eamon diskettes. No reviews in this issue.